Mobile banking allows its users to conduct financial transactions through mobile devices such as mobile phones and tablets. It is a service offered by banks and other financial institutions that allow users to obtain account balances, pay bills and transfer funds on their mobiles. However, mobile banking is different from mobile payment. Indeed, the latter is a service that allows users to pay for a product or service using a mobile device. Paying for purchases doesn’t require having a bank account. It is more often added to the phone bill or paid by cash to specific agents. Before digging into mobile banking and payment in Africa, it is important to remember that the continent is the fastest growing and second largest mobile phone market in the world. In 2016, there were over 1 billion mobile subscribers in Sub-Saharan Africa alone. 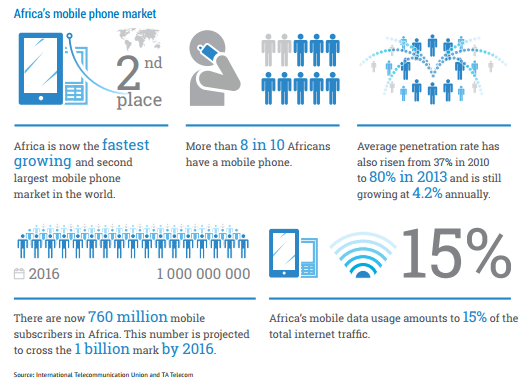 Also, 80% of Africans have mobile phones while only 20% of them had access to the internet as of 2015. On the other hand, barely 34% of adults in Sub-Saharan Africa had a bank account in 2014. This account penetration was mainly driven by mobile money accounts. In East Africa, where mobile money penetration is more important, the penetration of financial institution accounts remained steady at 24% whilst mobile money account penetration increased to 35%. In the light of these figures, it becomes obvious that Africans have higher access to mobile money than to mobile banking since a majority of them do not have bank accounts, to begin with. Has mobile money replaced banking in some parts of Africa? Bill Gates once said, “Banking is essential, banks are not.” It seems like Eastern Africa, mainly led by Kenya, has found a way around financial institutions. In fact, almost 60% of the population in Kenya holds mobile money accounts. With over 74% of the population living in rural areas, mobile money has made it possible for them to benefit from the perks of banking at lower costs. Moreover, this population doesn’t have fixed salaries since their main source of income is traditional agriculture. Therefore, banking to them is more of a luxury they cannot afford than a necessity for their day to day life. Since it was first launched in 2007 by Safaricom, Kenya’s largest mobile-network operator, mobile money has helped address social challenges while supporting the UN’s Sustainable Development Goals (SDGs). One of the first SDGs directly impacted there is financial inclusion (end poverty in all its forms everywhere). Mobile banking undoubtedly facilitated access to financial services for its 400 million registered users throughout the world. All in all, even though mobile payment does not perfectly meet the definition of financial institution services, it provides those who can’t afford banks with a wide range of financial services including microcredits and money transfers. The growing demand in East Africa mainly might, however, trigger the need for stricter regulations to protect the consumers. Sarah Nassiri, Analyst Intern at Infomineo. Source: African Development Bank, Tracking Africa’s progress in figures report, 2014. Source: The Global Findex Database 2014, World Bank Group, Development Research Group, Finance and Private Sector Development Team – April 2015. Source: Financial Development in Sub-Saharan Africa – Promoting Inclusive and Sustainable Growth, IMF (2016), team led by Montfort Mlachila. The Mobile Economy 2017, GSM Association.